Bats play an important role in nature. They eat thousands of mosquitoes every night, but they are not meant to live in the same dwellings as us humans. The caves and rock formations the bats once called home have been replaced by Toronto condominiums and houses. There are a lot of different species of bats throughout Ontario. Species known for colonizing are typically the ones causing headaches for home owners. Bats are usually very harmless and non-aggressive. The problem is the high amount of bodily waste they produce. A bat can produce 20 pellets of excrement in a day. It doesn’t take long for attics to collect dangerous amounts of bat guano. Bats can carry rabies, but generally they do not transmit the disease to humans. A more concerning issue is Histoplasmosis, a lung disease you can get from exposure to bat guano. Having bats in your home can also result in damages to your house. Guano can rot the wood and drywall in your home and cause harmful mold issues. In addition to harming the materials in your home, guano will produce a very unpleasant odour throughout your residence. It’s important to stop bats from getting into your home in the first place and to quickly identify if you do have a bat problem. This will save you a lot of stress and will ultimately save you money. Take a look around your home and search for gaps, cracks and holes in your house. It’s important to pay special attention to your roof lines, gable vents, soffit and eaves gaps, fascia boards and any other potential weak points. Bats typically will need an opening of 1/2 to 1 inch to get into your home. Eliminate any potential bat entry paths with polyurethane or chalk sealant. Bats have gained a bad reputation throughout history. There are a lot misconceptions out there about them. Typically, bats are not aggressive and do not bite people or wires. They prefer to live in attics because they are high above the ground, safe from predators, and have easy entry and exit points. Basically, an attic resembles the caves that bats are programmed to inhabit and raise their pups in. It’s also important to realize the important role that bats have in our ecosystem. The goal of any removal should be to ensure your home is bat-free, clean and that the bats are relocated in a humane fashion. Hiring a reputable pest control technician is the best way to deal with a bat problem. The first step will be a full inspection of the home, during this time the technician will install special that will allow bats to exit your home, but not allow them to enter again. After a few days the one way doors will be removed and any entry points in your home will be properly sealed. The cleanup process will follow and any mess left behind by the bats will be professionally removed. Every spring hundreds of female raccoons search the streets of Toronto for a safe place to give birth to their young. Unfortunately, they will often find existing structures such as attics, chimneys, underneath decks, outbuildings and other places in or around your home. The amount of raccoons in communities throughout Ontario continues to grow in urban areas. This growing population causes increased concerns for rabies, distemper, illness from raccoon waste and home fire risk. Raccoons are not shy, they will tear shingles, siding or break vent blades to enter into a new living space. They can easily fit into a hole three-to-four inches in diameter. Once inside the raccoon will create a nesting area and will designate a spot to be their toilet. As raccoons tend to defecate and urinate in the same spot, this will cause a very unpleasant odour. While living in a space raccoons tend to destroy insulation and wiring. This could be very hazardous for your home. In addition to finding a place to live, raccoons will also search for food. Raccoons are omnivores and will essentially eat anything they can find. The most likely place they’ll turn to is your garbage containers. It’s important to have secure garbage containers and try to store them in the garage until garbage day. When garbage cans are outside secure them with bungee cord. A raccoon’s natural diet consists of insects, frogs and fish. Raccoons are known to roll back sod in search of food. This can cause significant damage to your lawn. The best prevention against a raccoon problem is to minimize access to shelter, food and water. Take a look at your home and look for possible raccoon entry points. Be sure to repair any damaged areas of the exterior of your home, and pay special attention to vents. Loud noises in your attic, especially at night. Raccoon noises, which will resemble the sounds you may hear from a nest of baby birds. Noticeable damage on the outside of the house. Spilled garbage and damaged sod. Scratching, loud noises or chirping coming from your vents. Raccoons are very intelligent animals and it’s important to seek the help of professional raccoon control technicians. There are various ‘do it yourself’ solutions on the market, but they can often lead to poor results, falls or bites, injuries to the raccoons, and illnesses resulting from improper cleanup. Exclusion, and the installation of special heavy-duty raccoon-sized one way doors, and occasionally the additional us of humane trapping is the only permanent way of getting rid of raccoons. The animals must be physically excluded from your house, or relocated from the premise. Only covering entry points is a short-term solution, as raccoons will simply tear back into the dens they’ve created. Professional technicians will regularly check one way doors and traps to ensure raccoons are moved quickly and safely. Once all animals are removed the technician will secure the home and ensure that all entry points are covered. The technician will inspect the home for urine damage, feces, parasites, damaged insulation and chewed wiring. It’s summertime in Toronto and it’s a great time to spend outdoors. With the beautiful weather comes an increased risk of ticks and other pest control issues. Toronto Public Health recently announced that ticks in the Toronto region do not contain Lyme disease. The Toronto Public Health unit tested ticks in three different areas around the region including Morningside Park, Rogue Valley and Algonquin Island. There’s only one type of tick that carries Lyme disease in the Toronto region, the Blacklegged Tick. These ticks will live in long grass and wooded areas. They usually target people going for a hike or camping for the night. Lyme disease can be a scary concern for those who catch it. It’s a bacterial disease that attaches itself directly to the sufferer’s tissue or organs. The longer it’s left untreated the more severe the situation may become. Everyone will respond differently to Lyme disease. In the early stages it’s fairly easy to treat, but it’s also much harder to diagnose. Many times a person will see a bull’s-eye shaped rash appear in the area of a tick bite. Health officials have seen an increase in the amount of Lyme disease cases. In 2009 there were a total of 128 cases in Canada. By 2013 the amount of cases had increased to 682. It’s important to develop a routine of checking your skin for ticks after doing an outdoor activity. Cutting the lawn and walking pets are some of the common ways people come into contact with ticks. Wearing pants and light coloured clothing will also help you stay tick-free. There’s no guaranteed way to keep your home 100 percent tick-free, but there are some things you can do that will help. Ticks may not be carrying Lyme disease, but they will still leave annoying bites. Tick Pest Control Tips For Your Home – Keep your home clutter-free. Ticks can enter your home from pets, removing the clutter from your home will limit the places that ticks have to hide in. Pick up items from the floor and try to limit the amount of time that dirty laundry is left lying around. If you suspect a tick problem or any pest control problem you will want to make sure that you’re washing your clothes in hot water. Ticks are known to attach themselves to dirty laundry and bedding. It’s especially important to wash clothes that have been worn outside quickly, especially if you’ve been around long grass or in wooded areas. Leaving infected laundry on the floor may cause ticks to move to carpeted surfaces. Your home will need a thorough cleaning from top to bottom if you suspect ticks. Pay special attention to the cracks in the floor and baseboards. Make sure you clean any brooms or mops afterwards and throwaway the used vacuum bag. Severe tick infestations may require the assistance of a pest control professional. A Cannon Pest Control Professional Exterminator will have the right equipment, pesticides and experience to solve your tick pest control problem for good. Experience provides Toronto based exterminators with the knowledge needed to not only find ticks, but remove them quickly from your home. If your tick problem remains, despite your best efforts, you will want to contact a professional at Cannon Pest Control Toronto. Like us, mice like to stay inside when it’s cold outside. You really can’t blame them. Unfortunately, mice are not great roommates. Mice can carry various parasites, bacteria and diseases. They can also cause damage to your home and their tendency to chew through wires can create a dangerous fire hazard. Mice are interesting creatures in many ways. They have the ability to work their way across a narrow wire, they can squeeze their way through tiny holes and they are excellent at reproducing quickly. It’s important to pay attention to the warning signs. Families will often hear mice before seeing them, usually from the pitter-patter of tiny mice feet running in the ceiling. Another classic sign is chew marks on food and containers. It’s not unusual to find mouse droppings in cupboards or counter tops in the kitchen. Many times people see a mouse or two and assume that’s the mouse problem they’re dealing with. The math is actually scary. The average female mouse will give birth to an average of ten litters of baby mice in a year, each of these litters usually contain six mice. That’s a lot of of mice and also a lot of mouse droppings (the average mouse can leave 9,000 droppings during the course of a year). Oftentimes, people will begin by placing mouse traps around their home. This is an affordable and quick solution that can be effective. Usually it’s best to use more than one trap and to place them next to a wall. Remember, there’s really no such thing as one mouse, so be prepared to empty traps frequently. Some people are bothered by the idea of killing mice, there are various live traps on the market. Placing traps outside your home can also be an effective deterrent from stopping mice from entering your home. We find that peanut butter or cheese are great baits for mice. There are many different poison solutions on the market. They can work, but can be harmful for pets and small children, please do your research and use any poisons with caution. Unfortunately, poisons do not work instantly. Poisoned mice will crawl off and die somewhere in your home and the smell can be very unpleasant. A mouse infestation can be upsetting. A lot of preventative work can be done to eliminate mouse problems before they happen. Mice love the dark shade that forgotten clutter in the attic or basement provides. Keep these areas clutter-free and clean floors in your home often. Try to keep minimal amounts of pet food out in the open. Sometimes the best way to get rid of a mouse infestation is to get a pet cat. Mice are tiny creatures and they’re skilled at finding entry points into a home. It really doesn’t take much, a hole of less than 1/2 of an inch (smaller than a dime) will create enough of an opening. Spending some time searching for entry points into your home can stop your mouse problem before it even happens. While examining your home’s exterior walls, look for any light coming through cracks. Also, you’ll want to seal any damages that are causing air to enter from the outside. Like us, mice can enter your home through doors or windows. Replace any damaged window or door screens. Spending some time caulking these areas will help protect your home and can also save you some money on your heating and cooling bill. Sometimes mouse traps and cats are not enough. We recommend calling a professional pest exterminator if your mouse problem doesn’t go away. Our team of Toronto exterminators has plenty of experience dealing with all sorts of mouse problems. We take pride in not only removing the mice currently living in your home, but we also work with you to protect your home against future exterminations. Feel free to contact one of our experienced staff for more information. The snow is melting, shovels are being stored and spring is on the way. With the change in seasons comes time for the annual tradition of spring cleaning. This is a very important time in your battle against unwanted pests. A thorough spring cleaning in addition to some simple prep work can go a long way towards protecting your home and other Toronto homes. Pests usually operate with low activity during winter months. When the weather here in Toronto gets warmer they get more active and also get hungry. Springtime also triggers many pests to start the reproduction process, which can quickly turn your pest problem from being annoying to devastating. Typically, we see pests become more active in Toronto homes once the temperature rises to 15 C. This is when many will begin seeing and hearing pests for the first time. Let’s start with a pest’s favourite room in your home; the kitchen. It makes sense if you think about it; the kitchen is where most of the food is stored. Pests love two things: warm shelter and food. It’s important to look for any signs of pests in your cupboards. Pests tend to prefer dry foods and grains. Be sure to sweep everywhere and do a good mopping job. Ensure that all surfaces are cleaned. This will not only keep your kitchen looking great, it will help keep unwanted visitors away. Purchase some air-tight containers and use them to store away your dry foods. It doesn’t take a lot of food to gain a pest’s attention. Even a small crumb can attract their attention. A single crumb will actually trigger an ant to send a scented trail to the rest of the colony, alerting them to the potential food source. Vacuuming and wiping down every single corner and crevice of your entire kitchen will help keep pests out. Like people, pests need a way to get into your home. Inspect the doors and windows of your home. You’ll want to ensure that they are 100 percent sealed. Any cracks should be sealed up right away. You’ll also want to check your screen doors for damage and have them repaired. Bugs are attracted to light, the combination of an outside light on near a damaged door or window can serve as an unwanted invitation. Consider adding a mesh barrier to block areas underneath your deck, this will help keep bigger pests such as raccoons and skunks away. Don’t forget to include the yard in your springtime cleanup. Many pest problems actually begin with the yard. Standing water is a root of many pest problems, especially with annoying mosquitoes. Not only are mosquitoes and bugs annoying, they can carry some scary diseases. It’s also time to gather all your yard waste and throw it out. Pests such as termites, beetles and bees and wasps are attracted to such waste. Even firewood can cause issues if it’s not properly stored and too close to the house. It’s best to store firewood in a garage or storage shed. Cleaning leaves and other yard waste out of gutters will also help in your battle against pests. It’s also a good idea to trim up any vegetation around your house. Storage areas are another popular destination for pests. Like most people, you’ve probably added some clutter over the winter months. Old cardboard boxes, packaging and other unused items can quickly pile up in the garage, basement or closet. Removing such clutter can really help keep pests away. Try using plastic bins for storing items, not cardboard boxes. Not only are they more durable, but they are far less attractive for pests. Be careful of stored away clothing, this can be a great place for pests to live for long periods of time. Spring is a time for pests to forage for food and build suitable nests for their young. Bugs, rodents and other wildlife entering your home is uncomfortable and potentially dangerous. Spending some extra time cleaning and inspecting your home can really help any potential pest problem. It’s important to take any pest sighting seriously. Left unchecked a little nuisance can quickly turn into a full infestation. Sometimes the best solution against pests is to partner with a reputable pest management provider. An experienced pest control specialist will develop an action plan that will solve your pest problem today and for the future. At Cannon Pest Control, we’ve been helping Toronto and GTA homes and business owners stay pest free since 2006. Our talented team has over 140 years of combined pest control experience in Toronto and we’re here to help you. Rat Exterminators Toronto – Cannon Pest ControlThe summer of 2016 will be known in Toronto for being a hot and dry one, but it also may be known for rats. Exterminators and Pest Control Experts throughout the Greater Toronto Region are noticing a dramatic increase in rat populations in residential areas. Many experts point to the unusually hot summer temperatures and the increase in construction projects happening throughout the city. Some Toronto pest control companies are receiving ten times the usual amount of rat calls. Large scale construction projects will sometimes drive rat populations away from older and decrepit buildings and move them towards newer residential areas. A project such as the Union Station renovation can displace a large population of rats quickly. Warmer weather allows rats to be more active in their search for food. Construction coupled with a hot and dry summer create the perfect setting for rats to thrive in Toronto. Known for being secretive around humans, rats seem to be enjoying the city without the need to hide. Rats have been spotted in several buildings near the Rogers Centre and throughout downtown. They’ve even been spotted walking on busy sidewalks. City officials are aware of the rat population increase but are not sure of the exact number. Municipal Licensing and Standards will be managing property standards complaints involving rats and the Toronto Public Health will handle any rat sightings in city restaurants. Rats can be scary when they are in your home. They are known to transmit various diseases and their nesting and scavenging habits are very destructive to a home. It’s common for rats to gnaw on cables and wires, this could cause a serious fire risk. The commonly found Norway rat reaches sexual maturity in two to five months and can breed any time of the year. A litter may number from four to 22; females can have three to 12 litters a year. With reproduction numbers like that, it’s easy to see how rat problems worsen quickly with time. With the increase in the rat population, it’s very important to closely monitor for rats in your home. Rats are typically more active at night time, so it may be hard to witness them during daytime hours. Watch for common signs of rats such as capsule-shaped droppings, burrows, chewed food and gnaw marks on walls and surfaces. You may also find food crumbs in strange places. Rats will also tend to leave dirt or grease marks along walls and floorboards. A trained rat exterminator will conduct a full home inspection. They will target typical hotspots such as attics, crawlspaces, basements and other areas of your home. Also, they will do an inspection of the exterior of your home, looking for entry and exit points. Store-bought rat traps can be effective, but oftentimes they become less effective with time. Rats leave scent trails of urine and droppings to your home’s entry points, this allows rats to have a biological map to your house. There are a few things you can do around the house to make your home less attractive to rats. Try to stay on top of cleaning and keep your kitchen clutter-free. Keep food in rodent-proof containers and store garbage and compost in secure garbage bins. Even a tiny hole can provide rats access to your home. It’s important to inspect your entire home and try to find places where rats can enter your house, pay special attention to roof lines. Rats will hide away in your home’s clutter. Make efforts to remove piles of wood, old tires and any other potential rat home. Spend some time in the yard and make sure that any fallen fruit is picked up. Also, be sure to hide things such as grass seed and pet food. If you see a living or dead rat it’s important to react right away. The same can be said for rat droppings, clean the area immediately and come up with extermination plan. Never touch a wild rat, their large teeth can cause serious damage. They can also carry a wide range of scary diseases through their droppings, saliva and urine. In the event of an infestation, it is best to leave it to the experts and call a Toronto rat extermination company. There are various traps on the market that can help, but a professional exterminator will help keep your rat problems away for years to come. It may surprise you to learn that a good fall yard waste clean-up around your home is important for pest control. Removing fallen leaves and plant debris is important for two reasons it allows for proper drainage of basement window wells and removes organic debris which will decay providing a food source for some insects. Insects such as Sowbugs (commonly called potato bugs) and millipedes consume dead organic debris which is largely from the previous fall season. Since Sowbugs and Millipedes are a food source for spiders and centipedes these insects are also found as a result of the increased insect activity. It is possible to do a good fall yard waste clean-up and still encounter a pest problem. Some pest populations are a result of the environment nearby… such as neighbours. Do your part and clean yard waste around your home and property, if storing firewood keep it along a fence line away from your home. Tell your neighbours and family about the benefits of a good fall clean-up. Integrated pest management includes taking these steps to preventing a pest problem. If a pest problem does occur trust the professional exterminators at Cannon Pest Control. A Toronto autumn is a great time of year to take in some of nature’s best scenery. However, with the crisp weather comes an increase in pests in many Toronto homes. Like us, pests such as mice, rats, spiders and cockroaches look for places to take refuge from the upcoming winter months. At Cannon Pest Control we encourage all of our customers to properly pest-proof their homes. This can save a lot of money and avoid the inconvenience and damages resulting from a pest infestation. In addition to being a nuisance, pests can cause you and your family serious health issues. Rodents in the city can carry diseases such as Salmonella and Hantavirus. It only takes a small hole for a mouse to enter your home. It’s important to quickly find and seal all entry and exit points in your home before they make their way inside. Mice will also use the same holes year after year, this can result in rodent problems for years to come. Mice Pest Control Toronto, Rat Pest Control Toronto, RodentsRodents will also gnaw through wiring, this can dramatically increase the risk of fire in your home. Mice will make nests in your home’s insulation, the average female will produce four-to-seven pups in a litter and will produce eight litters in her lifetime. Rats and mice have a remarkable ability to survive and adapt to many conditions. They survive by foraging for food, they will inadvertently contaminate your food during this search. Rats prefer to eat grains or grain products such as cereal or bread. They can fit into a hole that’s as small as a 1/2 inch in size. Rats are excellent climbers, they have the ability to climb pipes on the outside of your home. They also have excellent balance, they can scale brick walls and can even crawl along power or phone lines. When winter months approach mice will gravitate to their nests. Mice have very limited vision and use their incredible sense of smell to establish routes to food sources. These paths will link their nests to food sources. A mouse nest is usually made of common household materials such as paper, leaves and grass. Typically, a mouse will live in the same nest for the entirety of their life, only a lack of food will convince them to move elsewhere. Strong sanitation practices are the best way to keep mice away. Be sure to keep your food and pet food away in a sealed container. Good housekeeping will help decrease the amount of mice in your home and may even eliminate the problem entirely. It’s estimated that a mouse can jump at least 12 inches vertically. This coupled with the amazing climbing ability can make it even more challenging to hide and secure food. Signs of a rodent problem will usually include gnaw marks on food and droppings near counter tops, drawers and cupboards. Rodents will typically live in close proximity to their human hosts, they will often build nests in wall voids, attics, between floors, under the house, in cabinets, and many other places. Cockroach Pest Control TorontoCockroaches are also a problem for Toronto-area homeowners. These insects feed on human and animal food and leave a nasty odour in your home. Cockroaches can also spread diseases through their droppings and saliva. Younger children are more at risk at contracting diseases from cockroaches. It’s not uncommon for people to suffer allergic reactions from cockroaches. Asthma can actually be triggered by a cockroach infestation. These bugs are extremely resilient and keeping your home clean won’t deter them. By the time you find a cockroach in your home it’s likely there are many more waiting. Unfortunately, your home provides the perfect breeding ground for cockroaches. There’s plenty of food, water, warmth and nesting areas. This allows them to be active 365 days a year. It’s estimated that they can survive a month without food and less than two weeks without water. Fix any damaged screens in doors. Take a look through your home and seal and cracks or crevices in the exterior of your home. Also, pay attention to openings for pipes and utilities. Ensure that you install door sweeps on every door leading to the outside. Make sure all vents and openings to chimneys are screened. Never leave food out. Purchase air-tight containers and use them to store all food. Also, insure that garbage is stored in air-tight containers as well. Inspect the exterior of your home and fix any loose or weather damaged mortar and weather stripping around windows and your basement foundation. Eliminate any moisture sites from your home. Repair any clogged drains or leaky pipes. If you have a wood stove or fireplace be sure to store your excess firewood at least 20 feet from the house. Also, keep any shrubs well-trimmed. Sometimes calling a professional exterminator is the best way to remove pests from your home. A good exterminator will remove all pests from your home and will ensure that don’t return anytime soon. It’s also important that all harmful droppings and urine damaged regions are dealt with properly. This will protect the integrity of your home and prevent dangerous health issues. At Cannon Pest Control, we take a lot of pride in our work and we strongly believe that we should exceed the expectations of our customers. That’s why we guarantee that we’ll keep your home pest-free for one year after our visit. 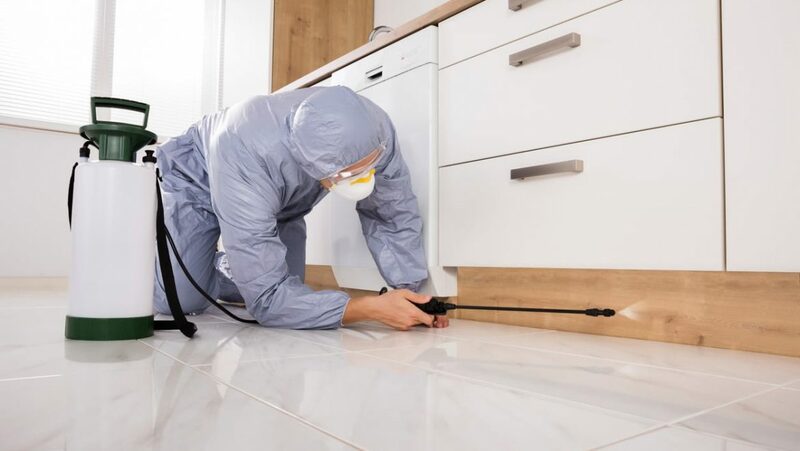 Our team of experienced exterminators are eager to help with any extermination need. We work throughout the entire Toronto region to ensure that your pest protection needs are addressed in a permanent and cost effective fashion. Contact us to learn more about how we can aid in your residential or commercial extermination needs. As the temperatures steadily climb to seasonal spring Toronto temperatures, spiders are busy spinning their webs. If you live closer to the lake or near any body of water you are likely very familiar with high spider activity this time of year. Spiders are considered beneficial insects and are generally not considered to be pests. However, homes located near bodies of water, near ravines or wooded areas often experience high levels of spider activity. Occasionally the spider infestation is due to another pest issue and the spiders are present due to the increased presence of this food source (as spiders trap and consume other insects). The professional pest control technicians at Cannon Pest Control can exterminate both the underlying insect issue as well as those pesky spiders. Typically it is a good idea to treat both the interior and exterior of your home, this will provide the best results and ensure your family has an insect free home. Preparation for a spider treatment is minimal but as with most inside pesticide applications you and your family (including pets) will need to vacate for a minimum of 4 hours. Cannon Pest Control services the Greater Toronto Area including Newmarket to the North, Burlington to the West, and Oshawa to the East. Call Cannon Pest Control today and say goodbye to the spiders and clean up the last of the webs for the season.